Did you know that Thanksgiving wasn’t established as a holiday until President Abraham Lincoln called for a nationwide day of thanks in 1863 amidst the fighting of the Civil War? Likewise, did you know that there was some disagreement if Thanksgiving should be the fourth or fifth Thursday of November depending on how the days fell? Well, Congress settled that during World War II with a 1942 resolution that made every fourth Thursday in November Thanksgiving. As this heritage of Thanksgiving illustrates, many times American men and women have been away from their homes fighting in service of our country instead of celebrating Thanksgiving with their families. 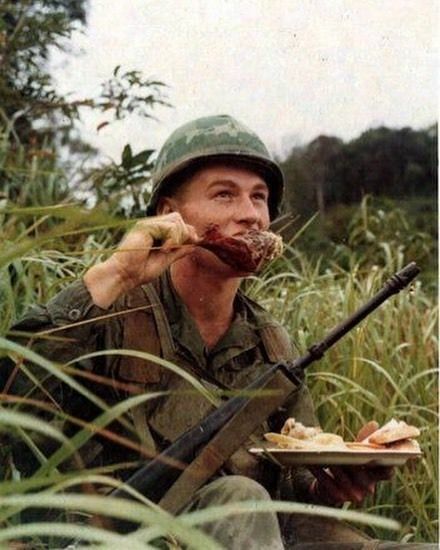 In honor of our service members deployed on Thanksgiving, let’s do a survey of history and see what Thanksgiving was like for our loved ones overseas. According to an article on DoD News, American soldiers received both Thanksgiving packages from the Red Cross and other organizations and dinners from families in France when they celebrated Thanksgiving overseas. During World War II, a concerted effort began to bring a turkey dinner to those serving in the war. Thus, turkey and cranberries replaced C- or K-rations, a tradition that has continued to the modern day. Robert Mejia remembers a cold walk in the snow to the hut where Thanksgiving dinner was served. Each service member got one piece of turkey, one spoonful of lumpy mashed potatoes, gravy with gizzard bits, and corn, one slice of bread, and hot coffee. As he ate this 1952 Thanksgiving dinner, he was grateful for all of his mom’s cooking at home. Stu Seashols talks about how Thanksgiving dinner was always extra special, and at least he had his buddies who shared his feelings of homesickness to eat those meals with him. For some who have served during wartime, Thanksgiving Day sometimes wasn’t even warm turkey dinners overseas. It sometimes involved tragic circumstances. In 1971, Francis Bilek heard that another one of the Chinooks that were taking his unit back to Camp Eagle had been shot down with 23 people on board. An hour later, he boarded a Chinook and kept telling himself that a bullet wasn’t going to rip through the floor of the helicopter he was in. Some people like Karla Branson in 1977 and 1978 were in the exact right country for Thanksgiving: Turkey in Turkey! President George H.W. 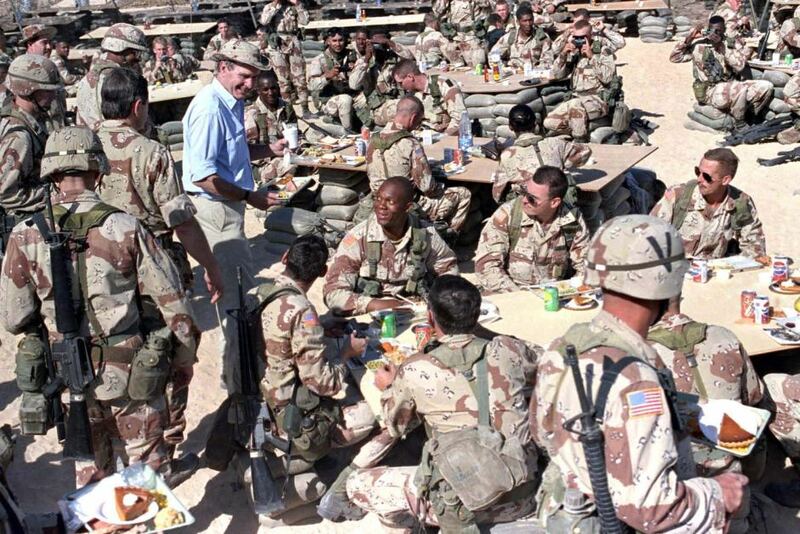 Bush helped to serve Thanksgiving dinner to troops serving in Saudi Arabia in 1990, which is a tradition that has continued to this day. Like President George H.W. Bush, Presidents George W. Bush and Barack Obama made surprise visits to Iraq in 2003 and Afghanistan in 2010 respectively to support our troops overseas. Karen Annette Tripp had 12-hour gate guard duty on Thanksgiving in the early 2000s, but she still received a plateful of Thanksgiving food from her buddies! Antony Schmiedeler and Richard Palmieri both served in Iraq for two Thanksgivings. They remembered Thanksgiving dinner as a great meal, and they said that they appreciated being with their buddies, who were almost closer than family. In the Middle East, troops serving in 2016 received special items that weren’t normally a part of chow: baked ham, egg nog, and pecan and sweet potato pies. Others harken to tried and true Thanksgiving traditions like football. Some troops serving in South Korea came together the Wednesday before Thanksgiving for the “ Toilet Bowl,” the annual flag football game between junior and senior soldiers. Fun Fact: In 2015, the Defense Logistics Agency sent over 34,000 pounds of turkey to our deployed troops, which is equivalent to the weight of 16 adult female hippos! Some deployed service members note how much they appreciate the support of their families like Bryan Mayorga deployed to Afghanistan in 2011. He said that his wife Cassandra and daughter Gracie have helped him stay focused even while he was overseas and also threw him an early Thanksgiving before he deployed. Natosha Monroe was deployed in Afghanistan in 2010 and said that she didn’t mind as much as others being deployed overseas over Thanksgiving. That being said, she did recognize that she wasn’t married and didn’t have kids. All the time, she did admit that she wished she were with family and pictured her mom riding in a Chinook or her Nana complaining about the dust. 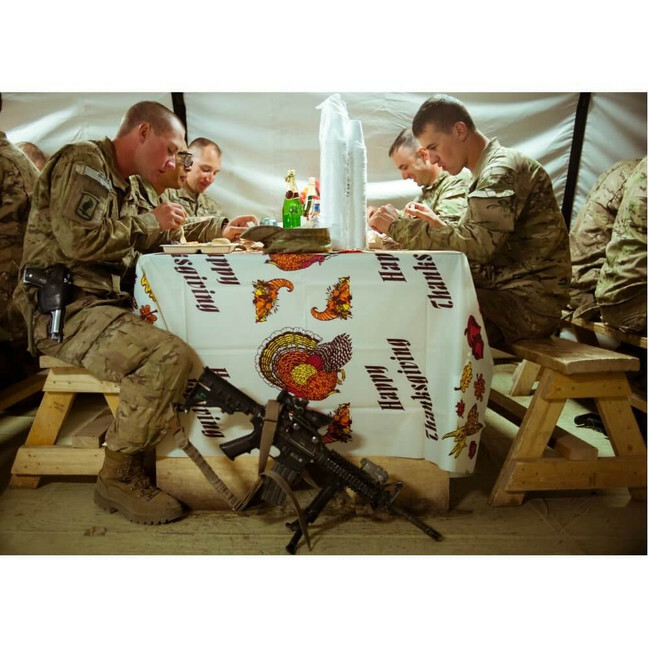 For many of you reading, your loved one is currently deployed overseas around Thanksgiving and the holiday season. That is hard. All you want is to be with your loved one. Hopefully, though, learning more about how other service members have spent Thanksgiving deployed will make you feel just a little bit better for this Thanksgiving apart. Your service member might be in Afghanistan or Spain, but he or she will get a Thanksgiving dinner even when he or she is far from home! Tell us about the times you or your loved one spent Thanksgiving apart. Do you have any great stories?